Keep Cool and Float On! 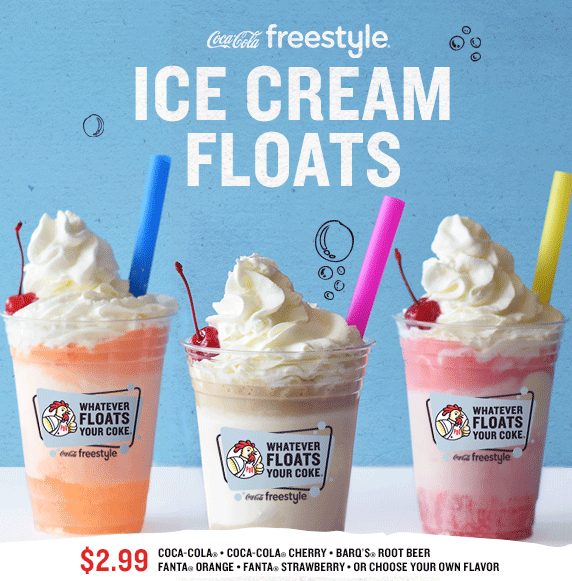 Introducing our new Coca-Cola Floats - available in a variety of Coca-Cola Freestyle flavors including Coca-Cola®, Barq's® Root Beer, Fanta® Strawberry, Fanta® Orange or Make Your Own. This summer staple is topped with whipped cream and a cherry on top, and will taste perfect with your favorite chicken sandwich, bowl, salad or tenders! Available at all PDQ locations in drive-thru and dine-in.